Thanks for the spirited discussion, Mamas. I hope we'll all still get along. Red, blue or purple, we're all still Mamas. That's what it's all about. Find the above here. 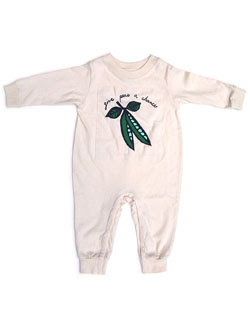 Below, the organic cotton version by Green Babies. These make me want to have another baby to dress up! Then again my 1st was 11lbs & they say each baby gets bigger. Yea, I think I will go one & done! My first was 10 lbs. Second was 10.3 lbs. He just had to beat out his sister. Both were all natural and healthy but amazingly the second delivery was sooooo much easier. That may also be due to his very mellow personality? Wow, big, healthy, wonderful babies! Mine weighed in at 8 lbs 2 oz and I thought that was big!